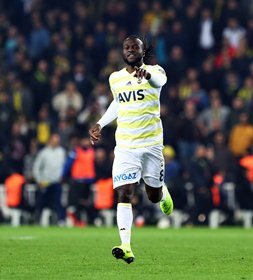 Chelsea loanee, Victor Moses made a cameo appearance for Fenerbahce n a bad-tempered 1-0 loss to Kayserispor in the Turkish Super League on Friday evening. Manager Ersun Yanal decided to summon the former Super Eagles winger from the bench in place of Mehmet Ekici just after the break for his third league appearance since transferring from Chelsea in the winter window. The change was a tactical decision as the Yellow Canaries were short on bodies up front following Roberto Soldado's sending off for a high heel challenge on Oleksandr Kucher before halftime. The 28-year-old who was booked shortly after coming on would nearly combine with Jailson for the opening goal of the game when he laid on a neat pass for the Brazilian whose shot was well saved. The hosts scored a late goal to come away victorious at the Kadir Has Şehir Stadı while Fener's woes were compounded when Tolgay Arslan was also shown a red in the closing stages. The defeat ensured Fenerbahce missed the chance to edge into the top half of the table and remain in 13th with 23 points. Moses and his teammates will now brace themselves up for a Europa League clash with Zenit Saint Petersburg next week.